I was sitting on the sofa last night trying to read a book but in reality I was still trying to understand how we could possibly have lost that match against Middlesbrough yesterday lunchtime. A match that we totally dominated, having the lion’s share of the possession, creating the better chances and yet somehow we came away with nothing. All the key moments were revolving around my brain on a tape loop. The chances we missed, particularly early on when we had the best defence in the league seemingly on the ropes, but we didn’t put them away and ultimately paid a heavy price for our profligacy. The way the ball always seemed to run Middlesbrough’s way at key times of the match, in particular when Stuart Dallas’s drive was pushed onto the post and with Andre Gray and Jota waiting eagerly for a simple tap in from the rebound, fate intervened and the ball came back, hit the goalkeeper and somehow diverted away from our players directly to a Middlesbrough defender. Gray had earlier headed wastefully and haplessly wide when presented with a free header right in front of goal by Pritchard’s perfect delivery and it was Alex who laid the ball to Jota from a cleverly worked free kick and Konstantopoulos somehow pushed his shot over the bar when he really should have been given no chance. Tarkowski too had a flick from a corner blocked on the goal line and the ball again bounced Middlesbrough’s way. Middlesbrough were forced to funnel back and simply try and absorb our pressure and they relied on a series of long balls into our half simply to create some breathing space and allow their overworked defenders some respite from our non-stop barrage. Their negativity didn’t deserve the reward it received right on halftime when the fates laughed at Brentford again when Harlee Dean, under no pressure, unaccountably allowed a harmless long ball from the left back to drift over his head and the predatory Bamford was in for the kill and with Button caught back on his heels, expecting his defender to head the ball to safety, Bamford touched the ball first before collapsing under the keeper’s late challenge for an obvious penalty and a chance that Leadbitter was never going to spurn. This, incredibly was Boro’s first attempt at goal and the Bees left the field at halftime trailing by a goal instead of holding the two goal advantage that their play and possession had fully merited. Middlesborough improved after the break and played a perfect cat and mouse game, breaking quickly from defence as we pushed forward and left the inevitable gaps at the back. We were cut open by a beautiful passing move that led to Adomah letting us off the hook when left with an open goal. Adam Forshaw, the new pantomime villain, then came on to the inevitable mixed reception and his presence enabled the visitors to keep possession for longer spells and frustrate us. Stuart Dallas really should have bought a four leafed clover on the way to the game as the Gods laughed at his immense efforts to score as he resembled nobody more than Sisyphus carrying his boulder up the hill before letting it drop at the final hurdle. On any other day he would have been celebrating a hat trick. After hitting the post before the break, he pealed away to the back post at a Jota corner and his twisting volley flew inches over, as did a twenty yarder that was hit like a shell. Right on time he had another perfectly hit volley blocked by former loanee Ryan Fredericks as it flew towards goal. It just wasn’t his day. Jota too had a long ranger well saved and Tarkowski could only hit the side netting from a tight angle, and the final blow came in the dying moments of added time when Bidwell played a half cleared corner back into the danger area and for once the ball dropped our way and Jonathan Douglas hit a close range effort that was heroically blocked by the keeper. How I hated that giant keeper Konstantopoulos when he, along with the towering Michael Nelson would so often prove an impassable barrier when playing against us for Hartlepool and now he came back to haunt us yet again with another match winning display. I watched the entire match again this morning and can now reflect on things in a calmer and more dispassionate manner. We really should take a deep breath and simply appreciate and take pride and delight in that we took probably the best and most organised team in the Championship right to the wire and both could and should have beaten them. We certainly missed Alan Judge and his speed of thought and trickery who would have moved the ball around quicker than we did but even without him, we created more than enough chances to win two matches..
That we didn’t win is really down to ourselves as we contributed to our unjustified defeat by shooting ourselves in the foot. It is a football truism that you have to score when you are on top, and in all honesty we totally dominated the first half with almost seventy percent possession. The chances we created were better than decent and at least two of them should have been put away. That would have forced Middlesbrough to come out at us rather than play on the break and we then could have done what they tried to do with us and picked them off . Middlesbrough were tough, compact and solid and gave nothing away, any goal scored against them would have to be earned and would not be donated. If you look at our comparative records, we have scored forty-four goals to Boro’s forty-three but we have conceded an incredible nineteen goals more than them. I fully appreciate that we play an open brand of football with the fullbacks often high up the pitch with the defence left exposed and there can be a harsh price to pay for that approach. I also concede that to an extent we have to accept the good with the bad, but all too often we contribute to our own downfall with carelessly conceded goals that are simply down to basic, unforced errors, lack of concentration, taking the wrong option and overplaying in dangerous areas of the pitch. It is hard enough to beat the top sides but it becomes almost impossible when you gift them a ridiculous and totally avoidable goal at a crucial period in the match. Just imagine the contrasting scenes in the two dressing rooms at halftime. We would have come off the pitch gutted at having not just dominated proceedings but wasting so many gilt edged chances and then conceding a daft goal, whereas Middlesbrough must have floated off the pitch hardly believing their good fortune. Mark Warburton correctly repeats the same mantra week after week about taking care of the ball and being more clinical, and we must remember that we have a team packed with young players who are still learning at this exalted level but we are now coming into the business end of the season and we have to start learning these lessons pretty quickly if we are to maintain our bid to reach the playoffs. I appreciate that I am perhaps giving into the sin of having raised expectations when I simply expected consolidation this season, but having spoken to several independent and impartial journalists over the past few days, they fully share my view that we are easily one of the best teams in this division and have a wonderful chance of promotion. We have brought in a highly promising young midfielder in Lewis Macleod who is on his way back to full fitness as well as a young striker in Everton’s Chris Long to strengthen our bench and the management team have stated that they feel that they now have a strong enough squad to maintain our challenge and are unlikely to bring anybody else in before the end of the transfer window tomorrow night. I was happy to go along with that decision, which is sensible, measured and pragmatic but now I am having second thoughts and I wonder if Mark Warburton and Frank McParland might be doing the same. I am not trying to hang Harlee Dean out to dry as he defends valiantly and has also learned to express himself, buy into our footballing philosophy and use the ball better, but is he going to be good enough to help us achieve the heights that we now seem to aspire towards? That is the key question that needs a quick answer. In my view at this point in his development he isn’t, and if the right player was available then I feel that another high quality central defender is needed if we are to eradicate these costly errors at the back. I appreciate that such players do not grow on trees and might not be readily available at a price we can afford but I firmly believe that our central defence is not currently good enough to allow us to sustain our challenge and tighten up at the back to the extent that is necessary. We have a similar problem up front where our plans were stymied by Hogan’s injury and whilst the gamble on Gray has paid off brilliantly, the management’s intention of relying on him to start every game with Long or Proschwitz on the bench to spell him late on is now looking less and less likely to achieve continued success. Young players get by on adrenalin but eventually run out of steam, lose confidence and need to be taken out of the firing line for a spell. Andre is snatching at his chances, a sure sign of waning self belief and whist his goals generally come in bursts he has now only scored once (and that a heavily deflected effort) in his last seven matches. He still runs the channels tirelessly and uses his strength well but is making poor decisions in front of goal and nothing is running for him. He missed horribly at Norwich early on, not helped by a bobble, and should have gobbled up the early headed chance yesterday. In the second half he sliced miles wide from directly in front of goal but was saved by the offside flag before again shrugging off his marker and roaring into the area before shooting weakly straight at the keeper when there were two colleagues in far better positions screaming for the ball in vain. He needs a rest and we need someone capable of starting a game, not just finishing one. Andre will come again but we need to protect him and I just wonder if yesterday will make our brains trust change their mind and try and bring in another option as Chris Long is promising but callow and inexperienced. Again though, it is the law of supply and demand and is there a long term solution just sitting there waiting for us to pounce? I somehow doubt it but we are so close to the finished article and promotion is well within our grasp. The allure of the Premier League beckons. Matthew Benham is a gambler but one who I am sure only puts his money down when it is as near to a sure thing as possible and I think it’s time for us to take an educated gamble, if players good enough to improve us can be identified and captured in time. I think Gillingham is a typical role model for everyone at Brentford Football Club to aim for. They have had several good seasons up at the Championship level and in that time they have managed to build themselves a good stadium and increase their supporter fanbase. It is clubs like Gillingham that we must aim to emulate. Just take a moment to reflect upon those words a few short years on and look at where the two respective clubs are now in the football pyramid. We have come so far in so short a time frame, we were in the bottom division when Middlesbrough were last flying high in the Premier League, and yet we could and should have beaten them yesterday. We are so, so close to being the finished article and I just hope that something can be done by tomorrow night to help us climb yet another rung up the ladder. Yesterday I had a look at the players who have signed for the Bees from Gillingham over the past few years – and a pretty motley crew they mostly are! Nicky Forster excepted, none of them really made a lasting impression on the club or supporters and, if truth be told, we have not really been the recipients of too much quality from the Medway. But it is when you look at the moves that have been made in the opposite direction you can see that there is a totally different story to tell and one that has subtly changed over the years. The first thing to remark upon is how many players have left us to join the Gills. This list also doesn’t take into account Carl Asaba, Stuart Nelson and Alan Julian who made the same journey but by a more circuitous route via Reading, Orient and Stevenage respectively. In the mid to late 1990’s Gillingham, managed by the combative Tony Pulis and then Peter Taylor, were ambitious, well funded by Paul Scally and on the rise. They saw Brentford, holed beneath the water line, as easy pickings and a fertile hunting ground for proven talent. In seemingly no time at all several of our best and most established players left Griffin Park for Gillingham, some on Bosman’s, others via tribunal rulings and transfers and the talent drain encompassed such talent as Paul Smith, Barry Ashby, Brian Statham, Robert Taylor and Carl Asaba. Brentford supporters were left sickened and horrified by these moves which were seen as proof of our own lack of ambition as well as asset stripping on a large scale. We felt bereft and denuded as so many of our favourites were allowed to leave the club and generally for far less than we felt they were worth. Asaba and Taylor in particular formed a lethal twin spearhead that lit up Wembley in that never to be forgotten Playoff Final classic against Manchester City. Paul Smith played over three hundred games for Gillingham as their midfield powerhouse and dynamo and Barry Ashby proved to be an impassable barrier at the back. The thought remained that they should still have been performing in a red and white striped shirt rather than in the blue of Gillingham! Eventually we rebuilt under Ron Noades after suffering relegation to the bottom division with a side of makeweights and nonentities, but the bitterness remained and Gillingham were seen as nouveau rich and deadly rivals purely out of our envy and jealousy. Now the boot is very firmly on the other foot. Gillingham eventually fell on hard times and are only now re-establishing themselves in the third flight. We, on the other hand, are on the crest of a wave. Instead of losing our best and brightest assets we are now sending Gillingham what we could unkindly term as our rejects. That is not to say that they are anything other than very decent established third division footballers, but for the most part they had outlived their use and were not really up to the magic carpet ride that we are currently on under Uwe Rosler and now, Mark Warburton. Leon Legge, in particular, was a firm fan favourite and there were certainly times last season when his height, strength and physicality, not forgetting his threat in opposing penalty areas, would have come in very useful, but for the most part, as an old-fashioned stopper, he was struggling to play with the ball at his feet – a pre-requisite in the new Brentford style of play. Myles Weston too ran into one blind alley too many and was jettisoned despite being a match winner on his too infrequent good days. Stuart Nelson was a firm favourite at Brentford under Martin Allen who also installed him as his first choice at Gillingham where he has been impressively consistent, managing to minimise the mad rushes of blood and poor kicking that so marred his spell at Griffin Park. 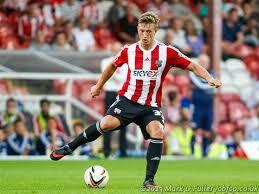 The latest export from Brentford, Luke Norris could in fact turn out to be absolutely anything. He has already demonstrated that he has an excellent eye for goal and is a calm and clinical finisher capable of both the tap in and the spectacular alike. He was highly unlikely to feature much in the Championship for Brentford next season and has quite understandably decided to move on. He is unproven in League One and much responsibility will be thrust upon him at Gillingham where he will vie for a starting role. Will he rise to the challenge? Who knows, but I would be very surprised if he does not score at least ten goals for the Gills next season given his striking ability. Time will tell and perhaps we will bemoan our not doing more to persuade Luke to stay and I suspect that we will in time come to regret his departure. The road to and from Gillingham has been well trodden and perhaps there will be even more moves over the next year or so. Maybe more of our squad players will end up plying their trade at the Priestfield Stadium and I certainly would not be unhappy if bright young talent such as Bradley Dack ended up coming in our direction. Let’s wait and see but in the meantime the Gillingford connection is as strong as ever. So it is farewell to Luke Norris who has decided to accept a two year deal from Gillingham rather than remain at Brentford. And who can blame him as he is twenty-one now and at an age where he feels that he needs to play regularly and start making a name for himself. Luke was another youth team product who spent four years at the club. He got his chance to show what he could do at first team level last season when he spent two productive loan spells at Northampton Town and Dagenham and Redbridge in League Two where he scored nine goals including some real crackers. He also made his first start for Brentford’s First Team and scored with a clinical finish for The Bees in the Johnstone’s Paint Trophy against AFC Wimbledon where he linked up well with Farid El Alagui. Given the choice of joining a League One team in Gillingham who are likely to offer him regular first team football at a decent level or biding his team at Griffin Park waiting for another opportunity it is hardly surprising that he has decided to leave. The Gills have also shown their faith in him by offering Luke a two year contract rather than the one year extension that he has been offered by Brentford. Luke showed that he has a keen eye for goal and clinical finishing ability so it is not beyond the bounds of possibility that he will come back to haunt us in the future. Indeed to a large degree I hope that he does as I am sure that we have included a decent sell-on clause into the deal with Gillingham and ideally he will earn a lucrative transfer for himself in the future once he earns his spurs at the Priestfield Stadium. Luke’s departure is merely the latest in a long conveyor belt of moves between the two clubs and it is interesting to examine some of them in more detail and decide who got the better end of the deals. The name that stands out is Nicky Forster who to my utter amazement joined the Bees in 1994 when he was being talked about as a future Premiership star. His agent “Monster, Monster” Eric Hall saw Brentford as a suitable staging post and the pacy striker gave us two and a half seasons of excellent service terrifying opponents with his pace and anticipation and horrifying us supporters with his utter inability to score from one-on-one opportunities. In a moment of true and typical Brentford folly and madness he was sold to Birmingham City in January 1997 at a time when we were miles ahead at the top of the league and looking like a shoo-in for promotion. The fact that his replacement was a total nonentity in QPR loanee Steve Slade spoke volumes for the club’s ambitions at the time. Talk about shooting yourself in the foot as we blew automatic promotion (and can David Webb please tell us why top scorer Carl Asaba was moved out to the left wing) and limped into the Playoffs where we were summarily despatched by Crewe in another Wembley non-event and abject surrender. Tony Funnell, the diminutive striker who looked more like the mascot than a player, was pretty much a waste of sixty thousand pounds but his late goal against Millwall did preserve our third tier status when relegation looked on the cards. Billy (The Pitbull) Manuel cost us a similar fee and was converted from an adequate left back into an excellent midfield ball winner who starred in our ill-fated season in the second tier. Simon Royce was also foisted on us by Gillingham but I realise that am being really unfair as he came predominantly as our goalkeeper coach and only played in an emergency after Richard Lee was sent off against Yeovil. He proved to be so far over the hill that he was coming down the other side and his first touch of the ball was to pick Paul Wotton’s fulminating free kick out of the net. His static goalkeeping also did little to help Andy Scott’s failing cause as we stumbled to a four goal to one thrashing at Dagenham in Royce’s only full appearance. Luckily he has proved to be an excellent coach! Do as I say rather than as I do might well be his motto! I think you might agree that our captures from Gillingham have been a bit hit and miss so in my next blog I will take a look at the talent that we have allowed to slip away to the Gills and decide who has ended up with the better side of the bargain.